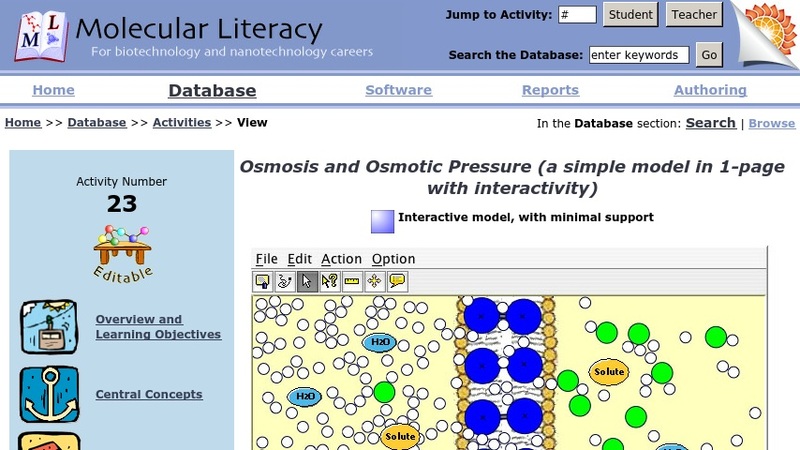 This is a very simple osmosis model. The white particles are meant to represent water molecules, while the green ones represent solute molecules. The two columns of big blue particles in the middle stand for the semipermeable membrane. They are horizontally linked and restrained at the positions indicated by the "x" letters, in order to mimic the stability of the membrane's molecular structure. Initially, the concentration of "water" molecules in the left compartment is higher than that of the right one, and the concentration of "solute" is lower on the left than that of the right. As the simulation proceeds, you will observe that "water" molecules from both sides diffuse through the "membrane" (but not the "solute" molecules). After some time, you may discover that the amount of "water" molecules that travel from left to right is more than that flowing in the reverse direction.